Quick Tech Pro is your Atlanta area computer service and repair company. Call us to fix your computer problems and get the help you need fast. Stop Enduring Mediocre Computer Service! We are committed to providing fast, reliable, affordable, honest computer service for you and your business. We will strive to earn the right to become your all purpose computer technical support service. Frustrated with inconsistent "Break-Fix" computer service from independent technicians or the person in your office who is "good with computers?" Imagine enjoying Big Company IT Department and Technical Resources at a fraction of the cost! Quick Tech Pro can be your outsource IT Department handling all your computer and network issues, freeing you to focus on operating and growing a successful business. At Quick Tech Pro we excel in troubleshooting computer issues, reducing downtime, lowering support cost, and providing a hassle and worry free work environment. Quick Tech Pro services will increase your company's efficiency, productivity and employee job satisfaction. Quick Tech Pro is an IT Department providing Fortune 500 service at affordable prices to Home, Small and Mid-Sized Businesses in the Southeastern United States. 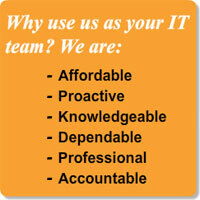 Quick Tech Pro is designed to give you the advantage of having your own IT Department- at affordable prices. Just like the IT departments of major corporations we will monitor, analyze, and update to help prevent downtime. We will handle all of your computer needs while you grow your business.